Knowing the key symptom profiles and pathology of each type of dementia can help with accurate diagnosis. This, in turn, will help to ensure your patients receive optimum treatment and support services appropriate to their condition and that they can maintain the highest possible quality of life. It is also important to recognise that there can be differences in experience and symptoms for individual patients, even in those within a patient group with the same type of dementia. There are over 100 diseases that may cause dementia. The most common and well known is Alzheimer’s disease. Other forms of dementia include Lewy Body disease, vascular dementia, younger onset dementia and frontotemporal dementia. Information for your patients about types of dementia. Eastern Cognitive Disorders Clinic (ECDC) was established in 2006 and is based at Box Hill Hospital in Melbourne, Victoria. ECDC is a diagnostic clinic specifically for patients with focal onset dementia and for those with cognitive syndromes that pose diagnostic difficulties. ECDC clinicians have a particular interest and expertise in the diagnosis and management of frontotemporal dementia. A referral from a medical practitioner is required in order to make an appointment in the clinic. Referrals are accepted from throughout Victoria and interstate. 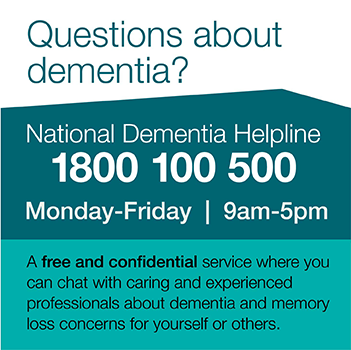 The Australian Frontotemporal Dementia Association (AFTDA) is a newly formed Association for Frontotemporal Degeneration of Australia, with similar goals as the Association of Frontotemporal Degeneration in the US to improve the quality of life for people affected by Frontotemporal Degeneration and drive research to a cure. The Lewy Body Dementia Association (LBDA) is a United States nonprofit organisation dedicated to raising awareness of the Lewy body dementias (LBD), supporting people with LBD as well as their families and caregivers and promoting scientific advances.